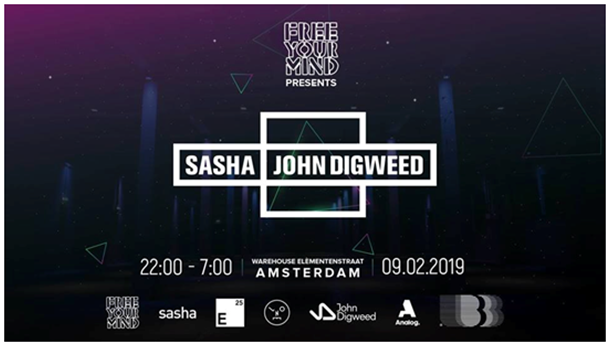 In February, Free Your Mind will be hosting their annual warehouse edition with Sasha & John Digweed again. FYM is known to champion new and innovative ways to engage with their audience and yet again, they’re pushing boundaries by partnering up with tech platform, Block-V. This amazing technology will enable people to pick up tickets for the show in a “Pokemon Go” type experience. Sasha & John Digweed have always been innovators in their field and continue to build on this mantra by embracing this impressive technology. On Sunday 13th January at 13:00 (CET), several “Sasha” and “John Digweed” virtual items will be dropped simultaneously in Trafalgar Square, London and in Dam Square, Amsterdam. With no app required, getting these tickets is a breeze. Just sign up and arrive at the location, at the correct time, to collect your tickets to what’s going to be another groundbreaking show! Find out all about in the video below! You can create your Block-V account at vatoms.com by signing up with your phone number or email address.